Many of you may not know this, but I was working for a photographer running film back and forth from the rafters at the Anaheim Ducks games during the playoffs. The work was not difficult, I simply had to go into the rafters of the Honda Center in between periods and change out the sim cards for the camera’s that were positioned at the top of the building. Prior to the game, I was asked by the photographer of the Ducks to assist in the photographing of David Archuleta who was singing the National Anthem that night. I was introduced by the photographer and shook his hand a couple of times. He seemed like a really nice guy and was smiling constantly displaying his upbeat attitude. I posted on my Facebook page that I was “hanging out” with David Archuleta and got a plethora of responses and jokingly, I said that he wanted to audition in the next Running Brothers Movie. I got a good laugh out of that comment and decided to post it to my Twitter page. The next thing I knew I was getting David Archuleta fans telling me how happy they were that he was going to be in our movie and watching our movie and making comments about it. Although I had no idea that my Twitter post would lead to that reaction it was kind of cool. 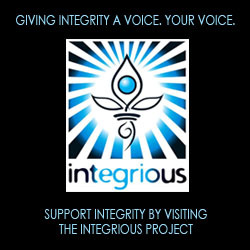 We even had several of his fan sites pick up the story and run with it, saying things like, “David Archuleta to be in the next Running Brothers Movie.” It was very cool, but I do want to clarify that I didn’t mean to be deceptive, I just thought it was a funny joke for my followers. Anyways, it was a lot of fun getting people to check out our movie and very interesting to see how die-hard David Archuleta fans are. One thing I can say for certain is that David Archuleta is a super cool dude and if he were interested in being in the next Running Brothers Movie we would love to have him. 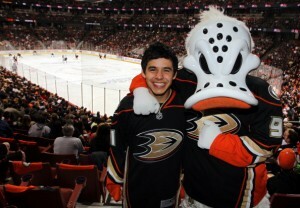 This was the picture that I helped to take of David Archuleta at the Anaheim Ducks game.